Asthma is a chronic inflammatory lung disease that results in airflow limitation, hyperreactivity, and airway remodeling. There is strong evidence that an imbalance between the reducing and oxidizing systems favoring a more oxidative state is present in asthma. 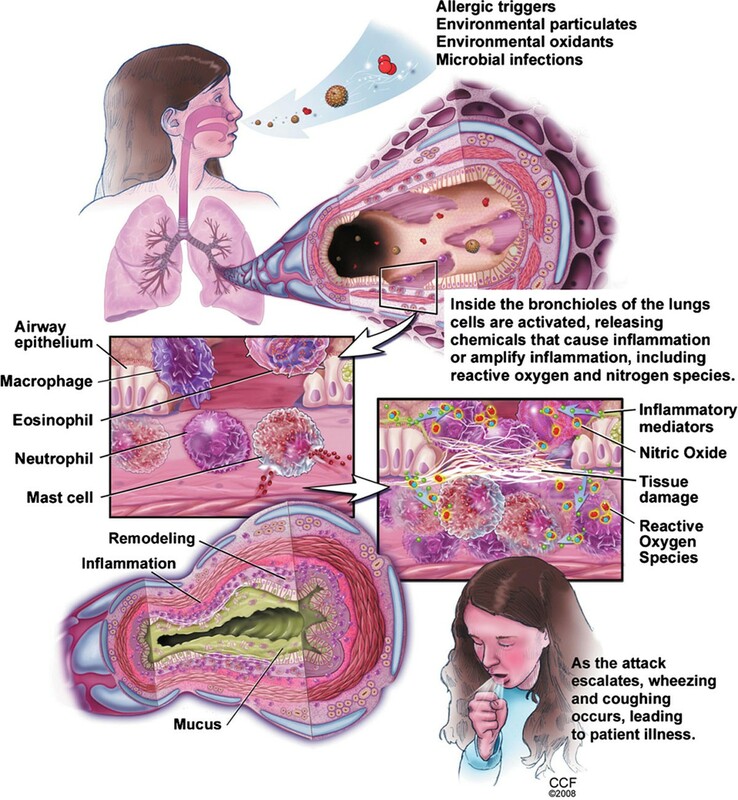 Endogenous and exogenous reactive oxygen species, such as superoxide anion, hydroxyl radical, hypohalite radical, and hydrogen peroxide, and reactive nitrogen species, such as nitric oxide, peroxynitrite, and nitrite, play a major role in the airway inflammation and are determinants of asthma severity. Asthma is also associated with decreased antioxidant defenses, such as superoxide dismutase, catalase, and glutathione. 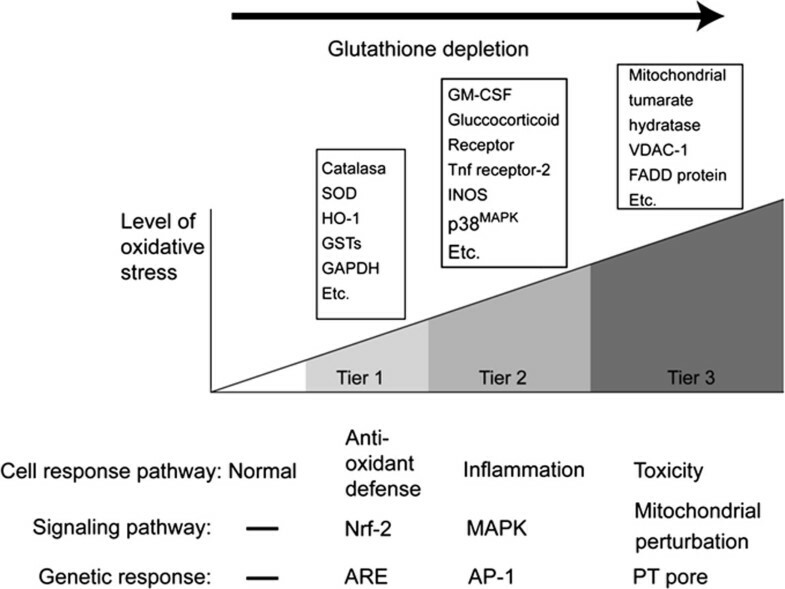 In this review, we will summarize the current knowledge and discuss the current and future strategies for the modulation of oxidative stress in asthma. Asthma is a chronic inflammatory lung disease involving complex interactions between numerous cell types and mediators that result in airway reactivity and airflow limitation [1–5]. 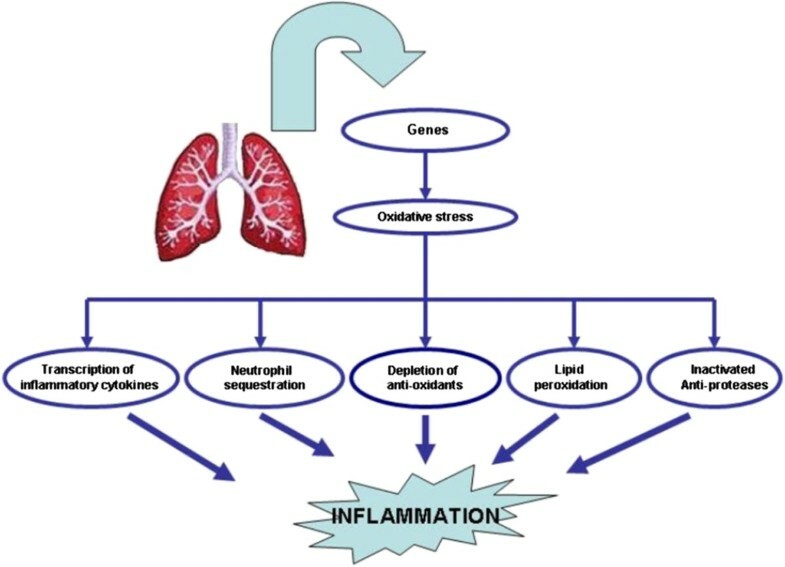 There is strong evidence that the endogenous and exogenous reactive oxygen and nitrogen species play a major role in the airway inflammation and are determinants of asthma severity[1–6] (Figure 1). Asthma pathophysiology. Adapted with permission from Comhair and Erzurum . According to a recently proposed hierarchical oxidative stress model, [8, 9] a low level of oxidative stress, such as exposure to diesel exhaust products for 6 hours at a concentration of 10 to 50 μg/mL,  leads to the activation of the transcription factor, nuclear erythroid 2 p45-related factor 2 (Nrf2), which encodes more than 200 genes. These gene products are responsible for a wide range of antioxidant, anti-inflammatory, cytoprotective, and detoxification functions and include catalase, superoxide dismutase (SOD)-3, heme oxygenase-1, glutathione-S-transferases, NAD(P)H-quinone oxidoreductase (NQO1), glutathione peroxidase, and glucuronosyltransferase-1a6 (UGT-1a6) . At low level of oxidative stress, antioxidants can restore cellular redox homeostasis. When high levels of oxidative stimuli are present, additional sets of intracellular signaling cascades are triggered that are potentially proinflammatory. These include mitogen-activated protein kinase and nuclear factor-κB (NF-κB), which lead to the expression of inflammatory cytokines, chemokines, and adhesion molecules. A further increase in the level of oxidative stress could ultimately trigger a cytotoxic response originating in the mitochondria and lead to cellular apoptosis or necrosis (Figure 2). The hierarchial oxidative stress model. Adapted with permission from Ridel and Nel . Inflammatory cells (such as activated eosinophils, neutrophils, monocytes, and macrophages) and resident cells (such as epithelial and smooth muscle cells) can generate reactive oxygen species (ROS) [12–14]. Sources of O 2 - include primarily nicotinamide adenine dinucleotide phosphate (NADP) oxidase-dependent complex, the cytosolic xanthine oxidase system, and the mitochondrial respiratory chain. O 2 - spontaneously or enzymatically dismutates to hydrogen peroxide (H2O2). Both O 2 - and H2O2 interact with iron and other metal ions and form OH- in biological systems [15–17]. Eosinophils, neutrophils, and monocytes contain peroxidases that catalyze the interaction between H2O2 and halides leading to the formation of hypohalides, such as HOCl. In addition, superoxide anion may also react with nitric oxide (NO) to form peroxynitrite (ONOO-), a potent ROS [13–17]. ROS can attack proteins to form carbonyls and react with nitrogen species and tyrosine to form nitrotyrosine. In murine and human studies, tyrosine nitration was shown to increase after allergen exposure in sensitized mice or atopic asthmatic humans . ROS also reacts with lipids to liberate isoprostane and ethane [19–21]. As a result, 8-isoprostane, a biomarker of lipid peroxidation, is elevated in the exhaled breath condensate in adults and children with asthma . Similar to the airways and systemic circulation, urinary levels of bromotyrosine and F2-isoprostanes are elevated in patients with asthma and are associated with an increased risk of having asthma. Excess production of ROS correlates with the degree of airway hyperresponsiveness as quntified by methacholine challenge [22–24]. Asthma attacks and experimental antigen challenges are both associated with immediate formation of O 2 - , being high at the sites of antigen challenge that persists throughout the late asthmatic phase . The main nitrogen species produced in the lung is NO. Autoxidation of NO with oxygen results in the formation of nitrite, a substrate for eosinophil peroxidase (EPO) and myeloperoxidase (MPO) . Nitric oxide reacts with superoxide to form ONOO-, which can nitrate tyrosine residues and thus damage enzymes, and structural and functional proteins [13–15, 25]. Higher NO levels are associated with higher risk of asthma, asthma severity, and greater response to bronchodilator agents [22, 26]. A link also exists between the increase in ROS and the asthma severity. ROS production by neutrophils correlates with the severity of the reactivity of airways . Increased levels of EPO and MPO correlate with the numbers and activation of eosinophils and neutrophils, respectively [28–30]. The level of 3-bromotyrosine, a unique product of EPO and eosinophils, was found to be 3 times higher in the bronchoalveolar lavage (BAL) fluid of individuals with asthma compared with that in the control subjects . In the intensive care unit, the level of 3-bromotyrosine in airways of severe asthma patients was 100-fold higher than that in individuals hospitalized for nonasthma causes . MPO-mediated oxidation is also related to asthma severity . Two to 3-fold elevations in chlorotyrosine are detected from allergen-challenged subsegments in asthmatic subjects . Similarly, children with asthma have increased levels of malondialdehyde, a marker of lipid peroxidation, and lower than normal levels of glutathione. Furthermore, the higher levels of malondialdehyde correlated with the severity of the asthma . Respiratory system has a large surface area that is in contact with the environment. Cigarette smoke, inhalation of airborne pollutants (ozone, nitrogen dioxide, sulfur dioxide), or particulate matter in the air can trigger symptoms of asthma . Recently, a clear relationship between traffic density and asthma exacerbations was demonstrated . Ultrafine particles with a diameter of < 0.1 μm may directly induce mitochondrial damage and make it difficult for the lungs to cope with oxidative stress . Cigarette smoke is related to asthma exacerbations, especially in young children, and there is a dose-dependent relationship between exposure to cigarette smoke and rates of asthma . Cigarette smoke is a highly complex mixture of more than 4000 chemical compounds that are distributed in aqueous, gas, and the tar phase of the smoke. In the gas phase, the smoke contains high concentrations of O 2 - and nitric oxide. They immediately react to form highly reactive peroxynitrite . The tar phase of the cigarette smoke contains organic radicals that react with molecular oxygen to form O 2 - , OH-, and H2O2. The tar phase is an effective metal chelator that chelates iron and generates H2O2 continuously. Aqueous phase of the cigarette smoke may undergo redox recycling for a period in the epithelial lining of the lungs . Homeostasis of cellular functions during oxidative stress depends on the appropriate induction of protective antioxidant mechanisms. Antioxidants are major in vivo and in situ defense mechanisms of the cells against oxidative stress [9, 13, 15–17]. Naturally occurring antioxidants work to protect cells and tissues against the continuous production of reactive oxygen and reactive nitrogen species during normal metabolism . Disequilibrium of the airway reducing state is a determinant of asthma initiation and severity [1, 4–6]. The nonenzymatic antioxidants include ascorbic acid, glutathione, albumin, α-tocopherol, uric acid, and β-carotene [41–44]. The major enzymatic antioxidants of the lungs are SODs, catalase, and glutathione peroxidases as well as heme oxygenase-1, thioredoxins, peroxiredoxins, and glutaredoxins . Asthma is characterized by the loss of antioxidant activities . We evaluated the enzymatic and nonenzymatic antioxidant systems in children with asthma . Levels of the enzymes glutathione peroxidase and SOD and of the nonenzymatic components of the antioxidant system including reduced glutathione, ascorbic acid, α-tocopherol, lycopene, and β-carotene were significantly lower in children with asthma compared with the healthy controls. In addition, of the amino acids contributing to glutathione synthesis, glycine, and glutamine were significantly lower in children with asthma. The majority of the amino acids susceptible to oxidative stress displayed lower levels in children with asthma. The results of this study clearly show that childhood asthma is associated with significant decreases in various components of both enzymatic and nonenzymatic antioxidant defenses . Because superoxide is the primary ROS produced from a variety of sources, its dismutation by SOD is of primary importance for each cell. All 3 forms of SOD (CuZn-SOD, Mn-SOD, and EC-SOD) are widely expressed in the human lung [46, 47]. SOD activity is significantly lower in epithelial lining fluid and airway epithelial cells in asthma patients compared with that in the healthy controls . Studies in large populations showed that the airway reactivity is inversely related to SOD activity [5, 48]. Transgenic mice that overexpress SOD had decreased allergen-induced physiologic changes in the airways compared with controls . It seems that the lower SOD activity is partly a consequence of the increased oxidative and nitrative stress in the asthmatic airway and serves as a sensitive marker of airway redox and asthma severity . In addition to lower SOD activity, CuZn-SOD protein is decreased in asthmatic airway epithelium . Oxidation and nitration of Mn-SOD are also present in the asthmatic airway, correlating with the severity of the asthma [48, 51]. Overall, the loss of SOD activity reflects oxidant stress in the airway . Catalase is a metalloprotein enzyme and the main scavenger of H2O2. It is effective in high concentrations of H2O2. Under prolonged oxidative stress, NADPH binds to the enzyme and stabilizes the structure and protects catalase from inactivation. This leads to the decrease in catalase activity . Both animal and human studies have shown that catalase activity in BAL fluid is lower in patients with asthma as compared with that in healthy controls . The lower catalase activity is due to nitration and oxidation, which identifies oxidative inactivation as the mechanism of activity loss in vivo . Extracellular glutathione peroxidase is higher than normal in the lungs of patients with asthma. Although ozone decreased the levels of glutathione peroxidase protein and activity, no change was detected with exposure to NO2 [6, 54]. During acute asthma exacerbations, glutathione levels in the exhaled breath condensate of children were found to be lower than those in the control subjects. In addition, the glutathione levels in exhaled breath condensate increased after oral steroid treatment compared with pretreatment levels . Glutathione depletion leads to the inhibition of Th1-associated cytokine production and favors Th2-associated response . In other words, reduction in glutathione levels supports the maintenance of Th2 response in asthma. Glutathione S-transferases (GST) include a number of subclasses, such as GST-P1 and GST-M1, that are expressed in the lungs and have been implicated in the pathogenesis of asthma. Children with GSTM1 null or GSTP1 val/val genotypes had increased respiratory symptoms upon exposure to ozone [33, 57, 58]. The same genotypes were associated with higher nasal IgE and histamine response . Because these polymorphisms have a high frequency,  they may have a substantial effect at the population level. GSTCD gene at 4q24 location was identified as one of the primary genes that determine lung function . We genotyped patients with asthma and healthy individuals for null variants of GSTT1 and GSTM1 and ile105val variant of GSTP1. Children with asthma possessing the GSTP1 val/val genotype had higher malondialdehyde and lower glutathione levels compared with other genotypes in the systemic circulation but not in the airways [33, 62]. This particular genotype was independently associated with the severity of childhood asthma. Similar genetic effects have been reported for SOD. Ala16Val mutation in Mn-SOD changes the secondary structure of the protein, which may affect the targeting of the protein to mitochondria . The EC-SOD R213G polymorphism is associated with reduced exacerbations in chronic obstructive pulmonary disease (COPD) and lower rates of hospitalization . However, neither R213G (EC-SOD) nor Ala16Val of Mn-SOD was associated with a genetic susceptibility to develop asthma . This is an area that needs further research (Figure 3). Genetic polymorphisms lead to pathophysiological changes that result in the inflammation of the airways. Oxidants are produced at higher amounts either spontaneously or after the stimulation in patients with asthma compared with healthy subjects. EPO and MPO are increased in the peripheral blood, induced sputum, and BAL fluid of patients with asthma [65–68]. Many direct or indirect markers of oxidative stress, including malondialdehyde, thiobarbituric acid, and glutathione disulfide, have been found in urine, plasma, sputum, and BAL fluid of patients with asthma, and the level of the markers correlated with the severity of the disease [67–69]. Analysis of exhaled breath condensate has allowed direct measurements of H2O2 and NO and the measurement of several indirect by-products of oxidation like isoprostane and ethane [20, 21]. Despite the difficulties to quantify the ROS because of their labile nature, the stable end products of the reactive pathways may be used as reliable markers of oxidative stress in patients with asthma . One clinically useful biomarker of airway inflammation is exhaled NO . During an asthma exacerbation and in the case of uncontrolled asthma, the airway environment becomes more acidic and oxidizing that leads to the release of NO from S-nitrosoglutathione (GSN), which leads to high levels of exhaled NO . Even though it is apparent that treatment modalities targeting the oxidant stress has a great potential for the treatment of many diseases including asthma, so far, human studies have failed to reveal a clear benefit. Thiol antioxidants that are metabolically converted to glutathione precursors are popular alternatives as antioxidant therapeutics. N-acetyl cysteine (NAC) is the most commonly used thiol precursor. NAC was found to suppress airway inflammation and hyperreactivity in animals and inhibit ROS production in human peripheral blood eosinophils . In animal models, oral NAC exerted an antioxidant protective effect and attenuated pulmonary inflammation [70, 72]. In humans, according to meta-analyses, NAC is able to decrease the exacerbation rate in patients with COPD by more than 20% [73–75]. However, in a controlled randomized study, NAC was found to be ineffective in preventing the deterioration in lung function and exacerbations in patients with COPD . In a recent study, NAC produced no significant benefit when added to conventional treatment during an asthma attack . The lack of clear benefit in human studies may be related to the relative instability of NAC [78, 79]. In addition to NAC, a more potent and orally available thiol antioxidant is bucillamine. It stimulates the production of precursors necessary for glutathione synthesis and induces Nrf2 release into the nucleus. Thus, it might function as Nrf2 agonist . Bucillamine was shown to be safe in humans but not tested yet for the reduction of oxidative stress in the respiratory system of patients . The results of the studies evaluating the effects of vitamins and nutrients on asthma have been controversial [82–88]. In a murine study, it was shown that the administration of vitamins C and E caused decreases in ragweed extract-induced ROS levels and is associated with lower airway allergic inflammation . In an ovalbumin-sensitized rat model, 4 days of oral treatment with γ-tocopherol diminished eosinophil infiltration in the nose, sinuses, and nasolacrimal duct but not in the lung after allergen challenge . Even though epidemiological studies have suggested that children with low dietary intake of vitamins and C E, and other antioxidants have in general more symptoms, [85, 89] the results of the clinical studies have been largely disappointing [86–88]. Interestingly, a recent study has even suggested that vitamin supplements may increase the oxidant stress. In this study, the investigators have hypothesized that the intake of antioxidant vitamins would augment the beneficial effects of exercise in patients with type 2 diabetes. In contrast to their expectations, the results have shown that daily supplementation with vitamin C and vitamin A for 4 weeks not only failed to improve the insulin responsiveness but also decreased the expression of ROS-sensitive transcriptional regulators, molecular mediators of ROS defense (SOD 1 and 2, glutathione peroxidase) . Thus, antioxidant supplement seems to have blocked endogenous defenses rather than counteract the oxidant stress. This emphasizes that exogeneous antioxidants need to block the oxidant pathways without suppressing the endogenous antioxidant mechanisms. The Nrf2 pathway is a negative regulator of inflammation according to the hierarchical oxidative stress model [8, 9]. Sulforaphane is a potent Nrf2 agonist, which is found in high amounts in broccoli. Studies using human bronchial epithelial cells confirm that sulforaphane is effective in suppressing the proinflammatory effects of diesel exhaust particles. It effectively upregulates GSTM1 and blocks interleukin (IL)-8, granulocyte-macrophage colony-stimulating factor (GMCSF), IL-1β production in the bronchial epithelial cells . Quercetin is a flavonoid molecule found in a variety of foods especially in apples and has antioxidant and anti-inflammatory properties [92, 93]. Quercetin was shown to inhibit proinflammatory cytokines and NO production through MAP kinases and NF-κB pathway in lipopolysaccharide-stimulated cells . Dietary intake of the soy isoflavone genistein was associated with reduced allergic respiratory symptoms . In animal models, genistein blocks allergen-induced airway inflammation in ex vivo allergen-challenged guinea-pig bronchi and lung specimens. Intratracheal instillation of genistein was shown to reduce leukotriene and histamine levels . In support of these studies, asthma patients with high dietary genistein consumption had less severe airflow obstruction than those who consume little or no genistein . α-Lipoic acid is a nonenzymatic antioxidant and is present in various foods and oral supplements. In an animal model, α-lipoic acid treatment was associated with reduced airway hyperresponsiveness, lower eosinophil counts, and IL-4 and IL-5 concentrations in BAL, improved pathology of the lungs, and lower intracellular ROS and NF-κB DNA-binding activity . Recently, Metha et al reported that choline and α-lipoic acid treatment reduces ROS production and isoprostanes in BAL fluid and thus suppresses oxidative stress. Another food derivative, epigallocatechin 3 gallate, a component of polyphenols derived from green tea, was shown to be a potent inhibitor of IL-1β-induced MUC5AC gene expression and MUC5AC secretion and has antioxidant activity . Transgenic mice that over express SOD have decreased allergen induced physiologic changes in the airway compared with controls . A number of SOD mimetics have been developed possessing antioxidant properties in vivo[99, 100] and their benefits have been identified in animal models . SOD mimetic (SODm) M40403 was shown to decrease the physiological and histopathological lung abnormalities in the ovalbumin model of allergic asthma reaction in sensitized guinea pigs . Ebselen, a nontoxic, seleno-organic drug, is an effective reductant of hydroperoxides. It mimics glutathione peroxidase. In animal models, it inhibits airway inflammation by reducing neutrophil chemotaxis and chemokine expression . Resveratrol, a phytoalexin found in seeds of grapes, has antioxidant and anti-inflammatory effects. It effectively inhibits oxidative damage and scavenges free radicals. It induces glutathione (GSH) synthesis and attenuates GSH depletion in lung epithelial cells during the oxidative stress . Most studies done thus far on resveratrol was performed on either animal models or in vitro systems. In a recent study, resveratrol blocked the release of both IL-8 and GM-CSF from alveolar macrophages of patients with COPD both at basal state and after stimulation with IL-1β and cigarette smoke . Resveratrol was shown to decrease IL-1 and tumor necrosis factor-α expression and reduce iNOS expression, COX-2 messenger RNA, and production of IL-8 and GM-CSF in human lung epithelial cells More studies need be done to understand how resveratrol fits into inflammatory pathways in the development of novel therapies for the treatment of asthma. Nanotechnology provides fullerene nanomaterials, which are soccer ball-shaped carbon cages that are among the most potent free radical scavengers due to their capacity to absorb electrons. They have been shown to inhibit IgE-mediated human mast cell and peripheral blood basophils mediator release in vitro . The clinical applications of these products in humans have not yet been investigated. Anti-inflammatory therapy using corticosteroids remains to be the mainstay of treatment and is emphasized in all guidelines [108, 109]. The efficacy of current asthma therapy in preventing the effects of oxidative stress is not yet clear and sometimes controversial. Corticosteroids may have direct effects on oxidative stress by decreasing the number and/or activity of cells involved in ROS . Even though some studies have suggested that they may also increase the antioxidant enzyme levels,  this observation was not supported by others . Clinical studies have produced some challenging results as well. In a recent study, it was shown that patients with asthma who were well controlled with inhaled corticosteroids and long-acting β2 agonists had higher lipid peroxide levels compared with healthy controls . Similarly, intranasal corticosteroids failed to prevent the oxidative burden produced by intranasal ragweed allergen challenge . It is also important to remember that ROS may inactivate histone deacetylase-2, an essential factor for corticosteroid inhibition of the inflammatory response . Asthma is associated with a strong oxidant stress that is a result of both increased oxidant forces and decreased antioxidant capacity. Even though modulation of this system offers great promise in the treatment of inflammatory diseases, such as asthma, more work is needed to discover a clinically useful compound.